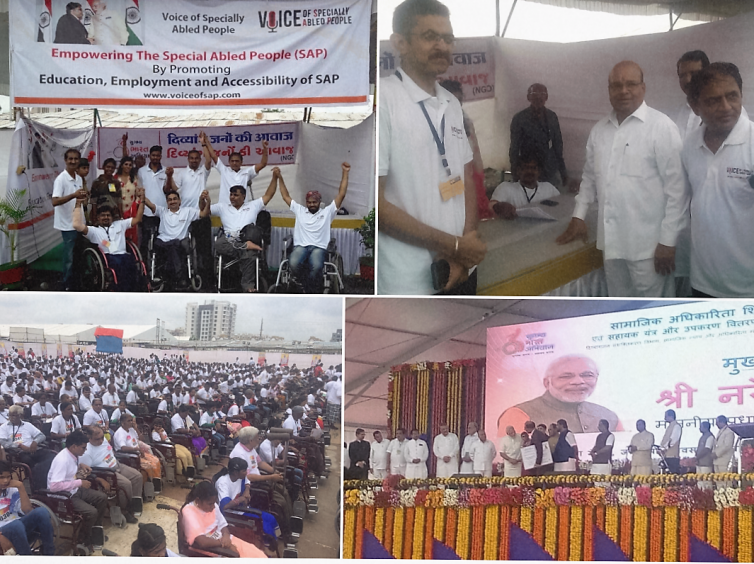 Sep 17 2016 has become a historic day in India’s Social Transformation journey for Specially Abled People called “Divyang-jan” by our H’ble PM Shri Modi ji. Here is why. VoSAP also joined the celebrations and witnessed this historic moment by having VoSP booth served by passionate volunteers. We thank H’ble Cabinet Minister, MSJE, Shri Gehlot ji to come to VoSAP booth and encourage our volunteers. We also thank Collector Shri Ravi Arora ji, MP Shri C. R. Patil ji and JS, MSJE Shri Awasthi ji for supporting VoSAP. Great job done by lead volunteer of VoSAP Shri Kalpeshbhai and entire team under guidance of Shri Bhushan Punani ji, BPA.